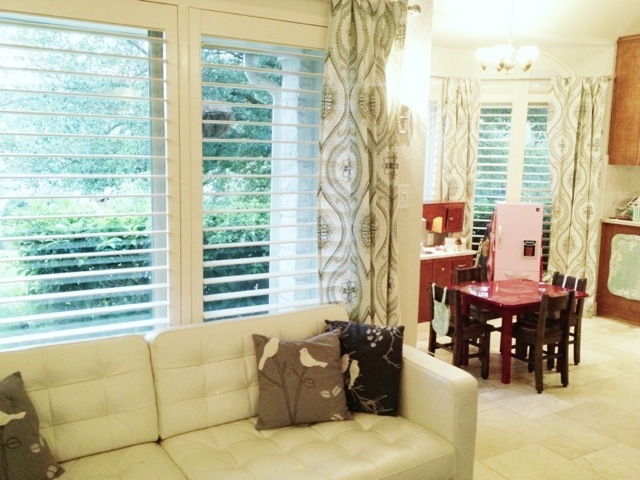 FINALLY, 3 months after having the entire house painted, curtains have been selected for a room. I started where we spend the most time and where I missed the curtains most. 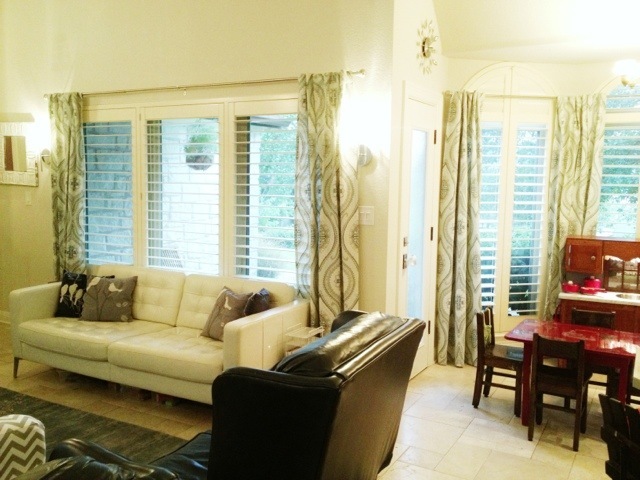 Actually, the family room is the one room where I really liked the curtains that came with the house, but they really didnt play we’ll with our things an I wanted to hold off hanging anything (an making holes) until I had settled on what we wanted. 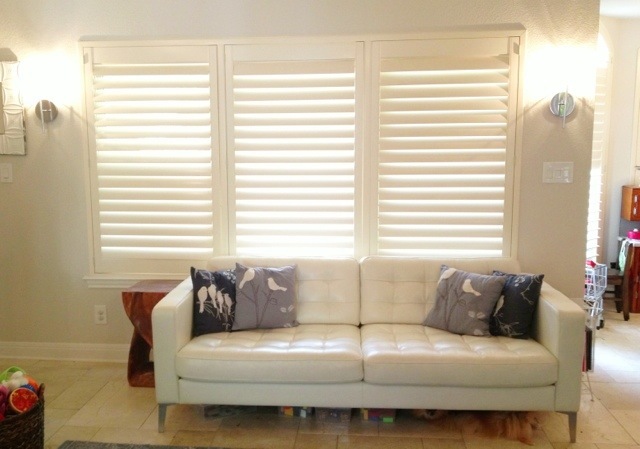 Because we have the beautiful shutters, there was no urgent need for privacy. 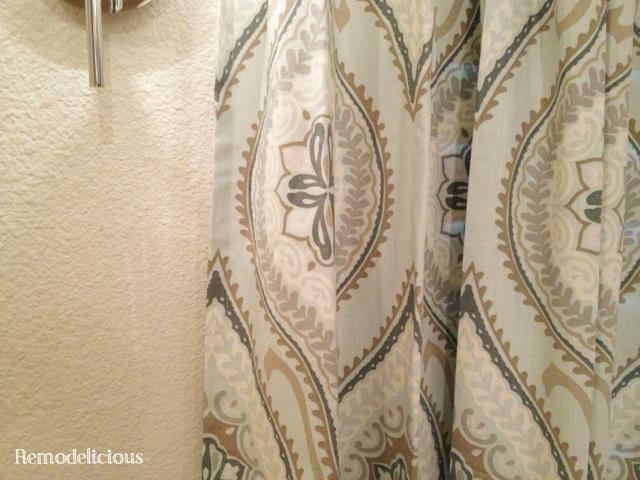 After MUCH deliberation, we finally found the perfect curtains. These are by “echo design”, available here for $29.99 per panel. I originally had something darker and more bold in mind, but nothing meeting that criteria seemed to work when we “tried them on” at home. My main goal in decorating is to bring some light into the house, keeping with an overall “updated classics” feel (which allows a lot of wiggle room for mixing the styles that we love). 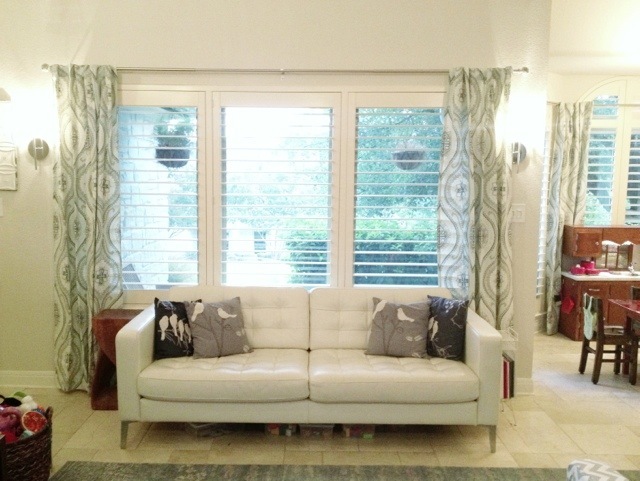 These curtains really fit the bill and brought in one of my favorite colors, aqua, into the mix. They also have a more true blue, gray, white and beige that tie into our rug, chairs, sofa, cabinets, and wooden furniture. Installation was pretty quick and painless using my trusty self-leveling laser level (available here), a pencil, and our drill. 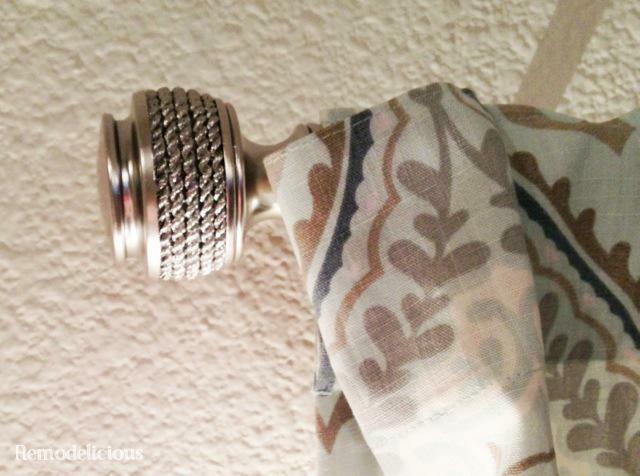 I held up the curtains and marked there I wanted the tops to be to use that as my guide for where the top of the curtain rod should be. The rods & finals are a set by Umbra called “nautical” from Bed, Bath, & Beyond. 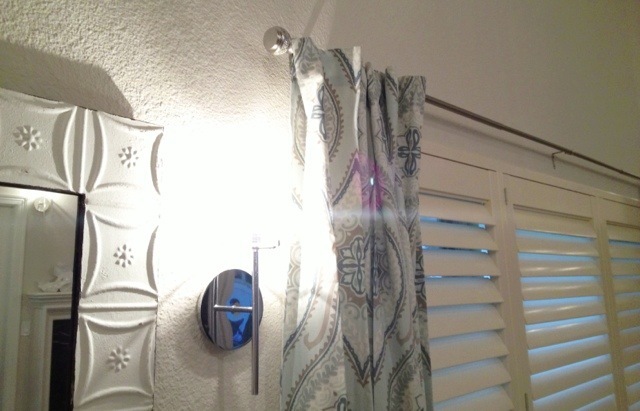 The curtains have tabs for hanging in the back, so no rings, hooks, or other hardware was needed and it gives a more modern look than the typical tab top or rod-pocket curtains. I really loved the texture of the rope-like section and the overall shape. The silver finish adds brightness. 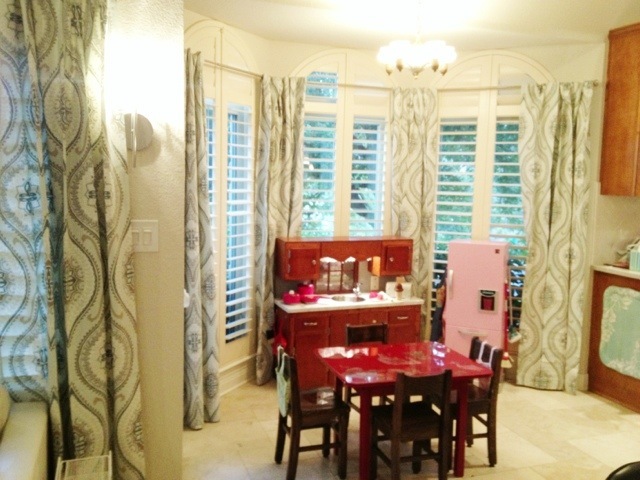 They looked so great, that I decided to carry the same look into the breakfast nook (a.k.a. “little kitchen”). 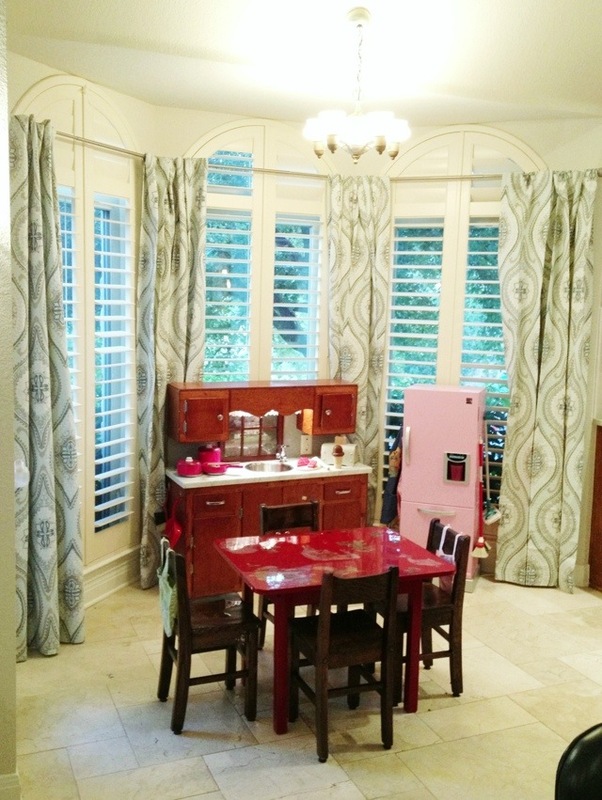 After my 3rd trip out for curtain hardware on Sunday, I finally found the perfect answer to hang the drapes in the breakfast nook. 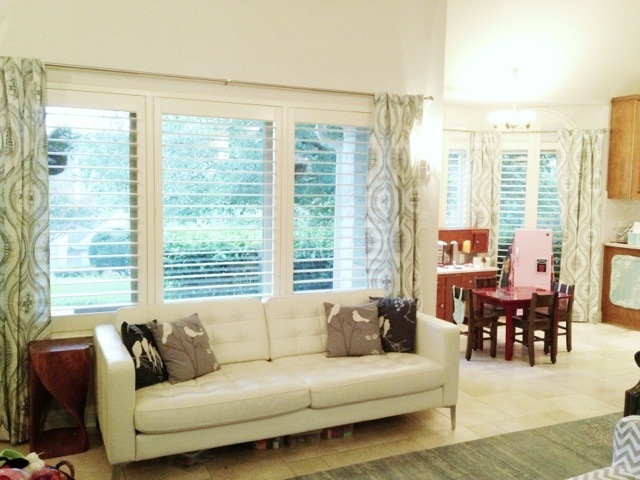 For the bay window, I used three 28″-48″ adjustable Cambria rods from Bed, Bath & Beyond in a silver finish that matched the finish of the umbra rod in the family room. I used these instead of the Umbra rods because they offer an elbow for going around the angles of a corner or bay window. Two of these did the trick! The finals didn’t match, so for $14.99, I purchased the Umbra nautical holdbacks (less expensive than buying another rod set) and replaced the Cambria finals with the finals from the Umbra holdbacks. You can’t even tell that they are from different manufacturers. Mission accomplished! As a curtain-challenged DIYer, I’m feeling pretty accomplished. While I’m on this curtain kick, I’m going to try to tackle a few more rooms.